Shiloh has a lot of grey happening around her muzzle but that started fairly early in her life. A more significant change is that she is now deaf. It took us a while to realize she is deaf. It is so different for us to come home and not have her pop-up when the door opens - we have to make her aware that we are there...Both Shiloh and Nahkohe have some arthritis issues but Shiloh has additional joint issues and is on dermaxx. Previously, Shiloh used to let us know (a specific type of bark) when she need to go potty and we would get up at night to let her out to do her business. This doesn't happen anymore - we put out pee pads for her now. Our Chowgirl is getting older and it's getting tough to see these changes. Our Chowboy is only a year younger but doesn't seem to have anything more than a few arthritis issues. We love our Chowdren and look forward to our morning jaunt tomorrow morning...as my DH says - "Let's wake up the neighborhood!" They grow on us and when they start having health issues it's like having human babies to take care of. I became a grandma 5 years ago and wasn't really paying as much attention to my chow Mikki and terrier Hunter. Mikki was always the smarter one, had her nose at the door as soon as I came home and she wanted the first one to be pet and put on the leash. Slowly I noticed that Hunter wasn't as eager, he had become totally deaf within a few months. Sadly Hunter passed away earlier this year, he used to be such a happy pooch. Mikki has been ill and I will have to make a decision. With Mikki - I failed (and the vet) to notice her dental issues. She lost a few teeth, infection got into the bone. It's inoperable and not wanting her to suffer, I will have to help her to stop the discomfort. She is 11 years old, has grey in her tail, her face is still pitch black. I don't think I will get anymore pets after. So many changes. I have had chows since 1996. When Hunter became deaf I'd knock on the floor when I put his food bowl down, it was his signal to get his food. I hope Shiloh will be with you for some time to come. Last edited by sit_by_the_beach on Fri Aug 15, 2014 9:10 am, edited 1 time in total. Sadly, this is all too familiar to me at the moment. Our rescued chow Loki seems to have gone deaf all of a sudden. I am taking him to the vet tomorrow but I fear the problem is his age. We think he is about 9 or 10. I would think that deafness would be a gradual thing but it has happened toLoki in a matter of weeks. Our other rescue chow, Frisco, is just about a year younger. We are all aging together but it is painful to witness these changes in our beloved pets. We try to be very careful when approaching Loki since he doesn't hear us and we don't want to startle him. I see the confusion on his face and it breaks my heart as he is such a proud dog. He hasn't lost his sense of smell. He still wants to chase the cat!!!!! Another Chow life change...today, my Nahkohe suffered a seizure. Hubby was home and on the back deck he heard some thrashing about. Nahkohe was having a seizure - stiff front legs, head rolled back, twitching eyes. Of course, Jeff dropped everything and made room in his truck to transport Nahkohe. He had to hold Nahkohe with one arm while he opened/closed the gates. After getting hubby's phone messages, I dashed home after calling the vet. Nahkohe was already out of the seizure but wobbly. It would be okay to bring him home as long as he is supervised. I will be working from home to monitor my Chowboy. This evening, Nahkohe is very docile and resting a lot. If he experiences more episodes, I'll take him in for a MRI. There's been a huge change in my life and Mikki's. I finally made arrangements to have Mikki chow euthanized, at home with Phoebe cat present and people around her she knew and loved. Luckily I only live 2 blocks from the vet's office. It's done and I cannot stop thinking how different the outcome could have been had I looked after Mikki's dental issues early on. Hunter the terrier passed away in January, now Mikki is gone too. I listen for sounds but the house is quiet. I joined this board after I adopted 3 year old Mikki in 2006. Can't see myself being without a chow and I might adopt an older one next year. If not, I'll foster. I'm so sorry for your loss, Karin. I hope you will be able to rescue or foster at some point...so many out there that need the love and shelter that some one like yourself can provide. We will light a candle for Mikki at our Chow Chow fest next month. I am so very sorry....it sounds like you have a lot of love to give. kingalls wrote: :( I'm so sorry for your loss, Karin. I hope you will be able to rescue or foster at some point...so many out there that need the love and shelter that some one like yourself can provide. Thanks for the kind words. It's tough, tougher than when I lost Luna in 2006. Luna had been very ill with some neurological disease which stopped her from walking, she stumbled getting up, she stopped eating, she was 12 years old. She didn't suffer long, she became sick within minutes. Mikki on the other hand was still going on her walks, had a huge appetite, was very strong. A friend was there with me and told me that Mikki may fight to live. Mikki got the sedative and was calm. Then the needle and I'd say 30 seconds later she sat up and looked around, looked at me and then lay down. The vet was very surprised that she'd be able to do that. That's our chows, strong, stubborn and determined to the end. While Mikki was still here I said I don't want to have to go through that again. Dogs just don't live long enough. But if it means to spare a chow from being put down because no home can be found, I will rescue one again. An older chow. There are so many in California, Georgia. Unreal. 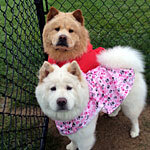 Here in Canada are about 3 or 4 chows looking for homes and they will find homes. I am going to visit relatives in Tennessee in the spring and will get a chow from Georgia. My niece is a huge dog lover and they won't mind to drive me there. I am 70 and at that age I don't want to get a puppy. I wish I had done so when I was much younger. I just don't want my pets to outlive me. Good for you!!! Mt chows aRe getting old and I know we don't have much more time with them. I know the loss is devastating but what is worse is the number of dogs that never get a chance at a loving home. this it tough...Nahkohe stopped eating after his seizure. He was so lethargic for the next couple of days. His vet assumed a brain tumor might be the problem and decided to do chest x-rays to see if any other issues existed. Unfortunately, the x-rays showed a large mass near his lung. We took him to an oncologist this past Thursday and without doing an MRI on his head and looking at his x-rays, she pretty much concluded what Nahkohe's vet suspects. The priority is his lack of appetite. We put him on steroids to perk up his appetite. Today he liked the beef jerky so that is a start in the right direction. We still know that the other issues may not be resolved but for now, we will have our Chowboy a bit longer if he continues to eat some food. Our hearts are so heavy and tomorrow our boy may be crossing Rainbow Bridge. He refuses to eat - no matter what the treat or food. Today our morning walk was okay for about 3/4 of the way...the last bit was not good to see. Mr. N was very slow and stumbled on his way back home. I am so sorry. This phase in their lives is never easy. Have you told Mr. N that it is okay to go? That you, Jeff and Shiloh will be okay and you don't want him to suffer? If not, you should. It will be difficult. But it helps both you and him. 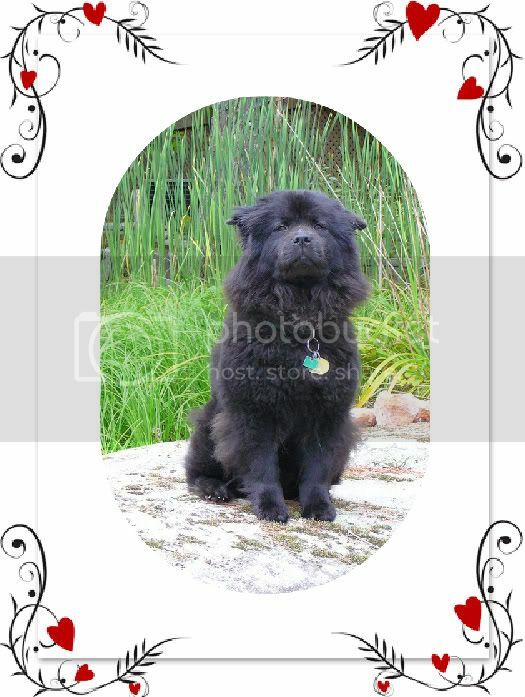 Also, when it is his time, there will be many, many chows waiting for him... Zhuyo for one, Miss PB, Indigo, Kodi, Milly and Mabel, plus all his chow pals he stayed away from at the chowfests. So he won't be alone. Is there a place at your home you both enjoy? If you notice his breathing becomes labored and he is preparing to cross over, maybe you can take him there for your final purple kiss. I remember Stacey (Bruin's dad) telling me he took his ChowMein outside to their backyard, looked up in the stars and he held and stayed with her until she took her last breath. I thought that was so beautiful. Otherwise, you will know when best to go to the vet for your boy. I had missed all of this except the original post but found it when I went in search of what happened with your baby boy. I am so sorry. It has to be awful to have a healthy happy boy one minute and then have everything change in one moment. My heart aches for you. I am so very sorry. I feel guilty for not having been around for the last few years. But I remember everyone and their chows. Sorry that Mr. Nahkohe is gone too now. We'll never get over the loss only time will heal somewhat and it will get easier as time goes on. Time to do some traveling which I haven't done since 1996 and then spring time another chow will come to the house. There are just too many needing forever homes. I am so sorry. I was in tears reading this post. My boy, Loki, is having health problems at the moment and it seemed to come on so suddenly. We will take each day as it comes. I never thought about that. I always thought chows and water didn't go together. He does love walking in the creek and taking a rest in the stream. It might be worth trying. We just had an ultrasound yesterday to rule out any other issues before aggressively treating the arthritis. He looks a bit silly with his belly shaved. Today I was listening to Pandora when Chasing Cars http://www.youtube.com/watch?v=eUahJpGi-VQ started playing…I looked at the calendar. It has been 3 months since I lost my beautiful Chowboy, Nahkohe. The first few weeks after losing Nahkohe, Shiloh was depressed but she was also having issues with a bladder infection and incontinence. I’m sure she picked up on my sadness as well. For days she would lay down facing the front door as though she was waiting for Nahkohe to come home. Much has changed in our household since then. We adopted a German Shepard mix puppy from a local rescue. He came from a litter of 9. While trying to figure out which one to adopt, this one puppy laid down in the center of the pen and hooked his paw. Jeff & I looked at each other and thought that it was a sign from Nahkohe that this was the one…Nahkohe always hooked his paw when he laid down. The first few weeks were stressful as anyone with a new puppy knows. It was especially difficult since Shiloh did not want anything to do with this bundle of energy. The puppy’s name is Kohana Kuruk. Like Nahkohe, we wanted to use an native American Indian name. At first I kept slipping up and calling the puppy Nahkohe. I mentioned it to my daughter and she pointed out that Kohana and Nahkohe had the same number of syllables. Then I realized that except for the letter “e”, the two names had the same letters. 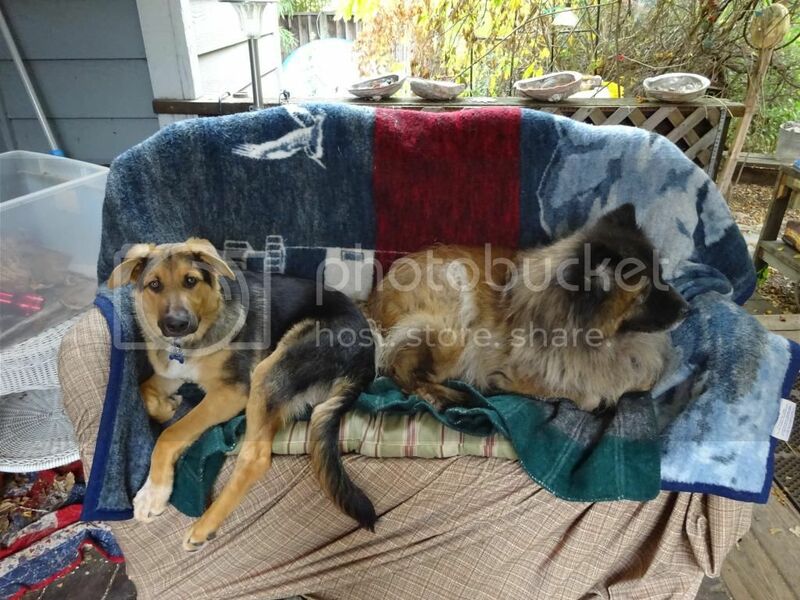 As much as Shiloh might get grumpy with the puppy, we often find them snuggled next to each other or sharing the same bench for their afternoon nap. Just as she did with Nahkohe, she is learning how to trick or outsmart Kohana. She loves her evening walks and still has a lot of bounce in her. Kohana has to be walked 2 to 3 times a day. Jeff takes him on a 2 mile hike a few times a week. Slowly we’ll work it up to the full 8 mile hikes as he matures. Our first Christmas with Kohana and without our Chowboy, Nahkohe. We took Kohana and Shiloh for a neighborhood Christmas Day walkie. Kohana is stubborn and won't walk too far ahead of Shiloh - he just sits and waits for her to catch up. On the other hand, Nahkohe would run with total disregard if Shiloh kept up. We have a special flameless candle that Zhuyo's mom made with his picture. We light it every evening and say goodnight when we turn it off. With the holidays it makes it more "difficult" because we miss the ones that are not around to share it with us. I'm glad that you decided to bring a new baby in to love. Nothing can replace the ones we lost but a new furry face does bring joy and laughter back into our lives. We took Shiloh and Kohana for a cold New Year's Day walk at a local park. It was maybe 34 degrees (cold for most Coastal Californians) but the two of them didn't mind the frost and frozen puddles. Shiloh was loving it - Kohana, too but he has been to the park before. We had to take a few shortcuts since Shiloh's arthritis limits the distance she can walk. It is always so sweet that Kohana will only go so far ahead of Shiloh and then just park his rear end down and wait for her to catch up. At the end of the walk, we got them loaded up and I looked back at Shiloh - she had the total Happy Face look. I know the walk was a stretch for her but she loved it. Our ole Chow girl is hanging in there...as much as Kohana can be overwhelming for her, we think he is also giving her a little more motive to keep up. We have baby gates that keep the furkids from getting to the front door. It's always been a fear for us to have the front door open and one of them dashing out. Shiloh will paw at the gate when she wants to check out the other side. Friday night I was watching a movie with my daughter & grandson on this other side and let Shiloh over to sniff things out. One of the things she would always do is go upstairs and check out the bedrooms and hallway. This time she only stood and stared at the staircase. It is difficult for her to just go up the 2 porch steps and I am sure the stairs now look impossible to her. I had to rescue my big baby, Nahkohe, when he went up stairs and was afraid to go back down. I suppose if I could carry him downstairs, I could carry Shiloh up and down when she wants to check it out.